Discover interesting facts and information about the methods of Making Fire used by Native American Indian tribes. Making Fire was one of the most important tasks undertaken on practically a daily basis by Native American Indians, especially if they tribe that they belonged too lived a nomadic lifestyle. One of the first things to be done when setting up a new camp was to build a campfire. 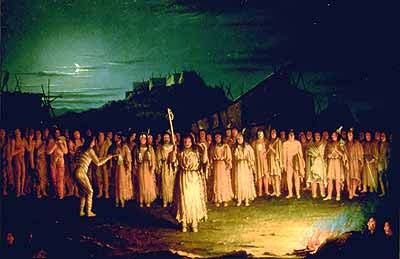 The campfire had many purposes and making fire ensured that the Indian camp would have heat for warmth and cooking but it also provided light and served to frighten animals and bad spirits. Fire was also used as a warning signal, similar to Smoke Signals. The method of making fire by whirling and placing pressure on sticks was hard work and produced painful blisters. This experience in making fire rose to the invention of a bow drill. In a bow drill the stick is rotated with increased speed by virtue of the back-and-forth movement of a bow, the string of which is looped around it. 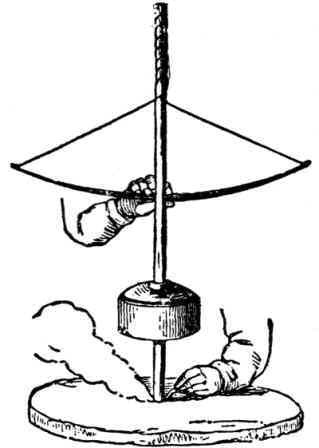 The pump drill, as illustrated below, was a variation of the bow drill and hand drill that used a different method of getting the drill to spin. Making Fire was also an essential task when cooking was required. Before the Europeans came to North America the Native Americans did not have metals, so they did not possess pots, pans or kettles. So what methods were used for cooking food? Making fire for cooking could be put to good use in the preservation of foods. 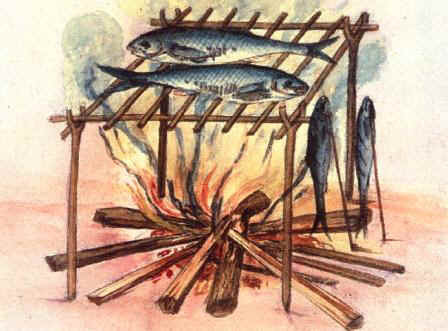 The picture at the top of the page shows how fish was cured over an open fire. Other methods included drying meat by cutting it into strips or sheets, and drying it by hanging it on lines. Curing meat and fish means saving or preserving meat by using processes such as drying, salting and smoking. Dried meat was made into Pemmican. Making Fire. Discover the interesting facts and information which relate to the History of Native Americans and the weapons they used such as the Making Fire. The pictures on this site show the weapons and tools that were used by various Native Indian tribes that can be used as a really useful educational history resource for kids and children of all ages. We have included pictures and videos to accompany the main topic of this section - Making Fire. The videos enable fast access to the images, paintings and pictures together with information and many historical facts. All of the articles and pages can be accessed via the Native Indian Tribes Index - a great educational resource for kids providing an unusual insight into their culture. We hope you enjoy watching the videos - just click and play - a great resource for gaining facts and information about the life of Native American Indians.